Easily identity lights with decorative switch plates labels & custom engraved name tags and stop guessing which switch does what. Choose the finish that's right for you and label your garbage disposal, fireplace, porch light, ceiling fan, kitchen lights, hall lights, and more. Shop 12 sets of pre-made labeling tags or order custom engraved name tags. Identify light switches for guests and homeowners alike in any room of your home. Before: Switch plate labeled with handwriting on masking tape. Sure, it gets the job done. But it's creating an eye-sore for this business's customers. After: Neatly engraved labels for switches gives a more professional look. What a difference! 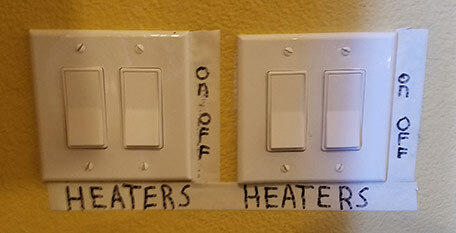 Now, customer's won't be turned off by the sloppy handwritten labels for these heater switches. 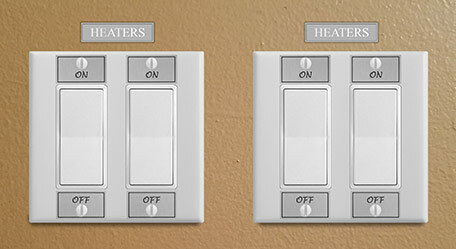 The on/off light switch labels are Set #16 and the heater label is one of these custom engraved plates. The on/off labels are non-stick and are installed under your switchplate's screws. The engraved label tags come with an adhesive back for attaching directly to your wall plates. (Note that sticking directly to the wall may cause damage if removed). Light switch labels are excellent for businesses, large offices, schools and other public spaces where lots of different people will be using the switches. Labels are also great for Senior Living Facilities and homes in which elderly people with dementia or mentally handicapped people reside. If you live in a large home with lots of switches lined up, labels can also take the guesswork out of which switch does what. Our labels are perfect for hotels and vacation rental homes where occupants change on a regular basis.